On the way back from seeing progress with repainting our boat in the autumn I took up an invitation to visit Willow Wren Training. They are excavating the arm at their training centre which had been filled in many years ago. The short arm they had previously excavated had been stopped off, the fish removed, and the water pumped out. 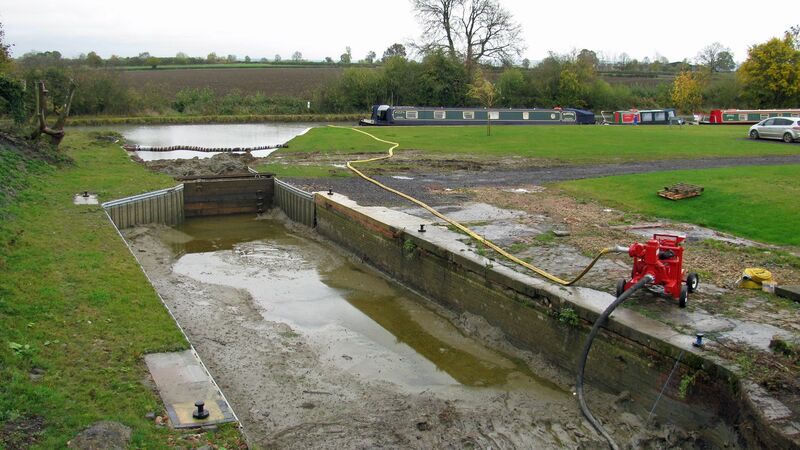 The drained arm under restoration at Nelson’s Wharf. Looking the other way, the excavation is progressing. The original walls have been found and it’s not known exactly how far the arm used to go, although old plans suggest there’s a little further to go. Careful digging will eventually reveal the end. 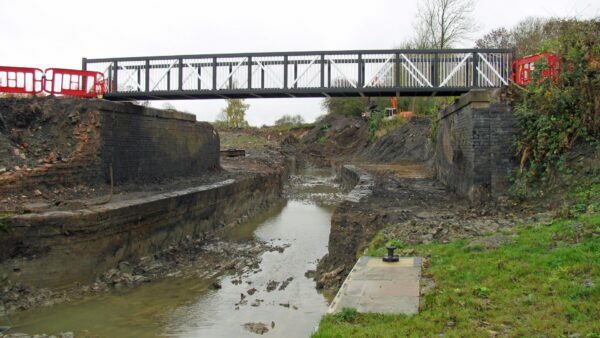 A public footpath crossed the arm on the level before the excavation started and the right of way has been maintained by providing a new footbridge. Steve & Izzie Vaughan, standing on their new bridge. Here’s Steve & Izzie Vaughan wondering how long the arm will be when the excavation reaches the end. The style of the bridge looked familiar and Steve reminded me where I had seen it before. 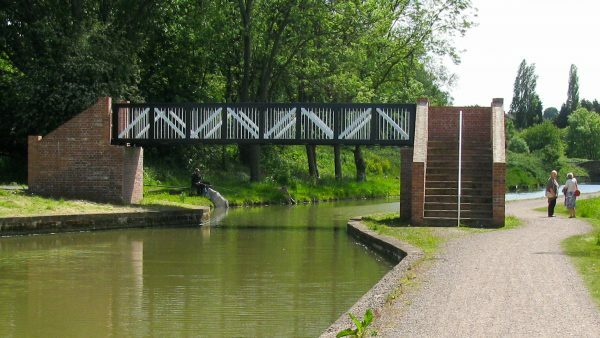 It was on the Chesterfield Canal, near Staveley Basin, as Constitution Hill Bridge 11 on the open section from Chesterfield. With Willow Wren’s bridge having six pairs of panels and Constitution Hill Bridge having four pairs of panels it looked like Willow Wren had the larger bridge, until I remembered another bridge. On the section of the Chesterfield Canal which is still to be restored, where some work has already been undertaken, stands Renishaw Foundry Footbridge 18B. 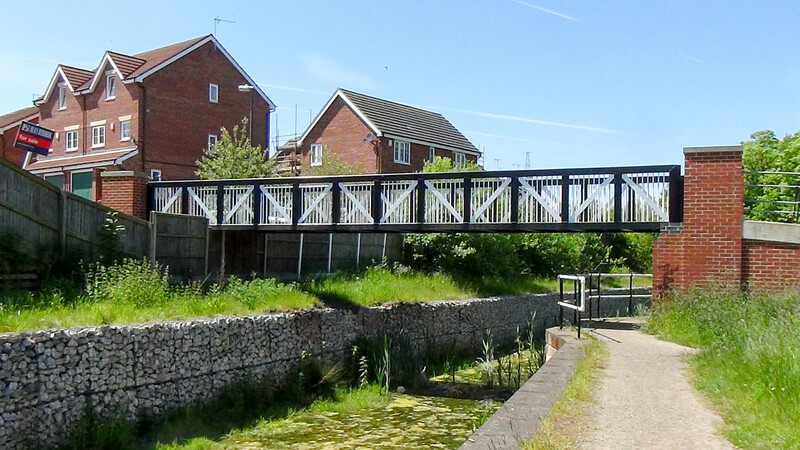 This also has six pairs of panels, the same as Willow Wren Training’s bridge, so it looks like a draw. 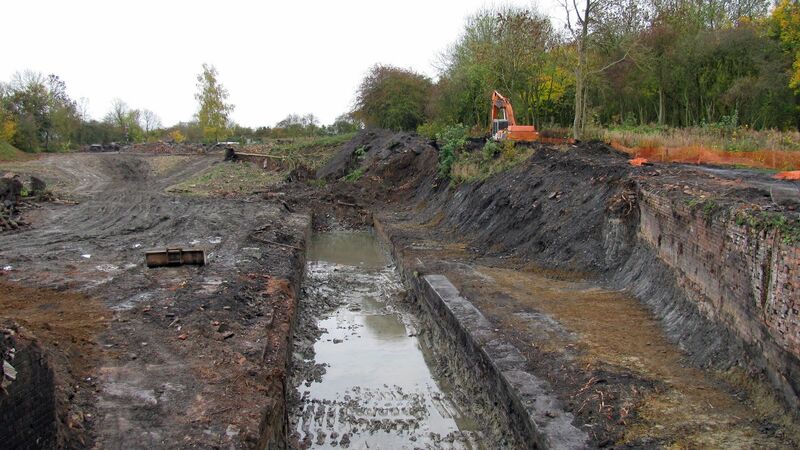 You can see more about the excavation and progress to see how long the arm is on Willow Wren Training’s website. This entry was posted in Chesterfield Canal, Grand Union Canal by Paul. Bookmark the permalink. 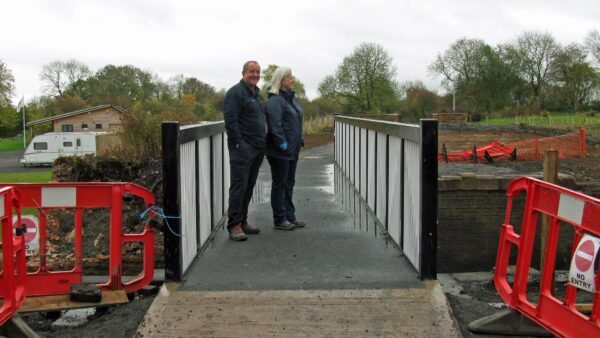 Or for a very slight variation on the theme, try Park Farm Marina’s new entrance bridge.